Neil and Gauri have made it big and are enjoying life with their doting daughter Neilakshi. Holidaying in Cuba, little do they know that the selfie they send back to their daughter in India will be their last, as they are attacked by mysterious men. They cannot be traced and there are rumors of murder. The governments of both the nations jointly investigate and try to find them at war footing level. Their friends wonder why someone is hell bent on breaking the lovers apart, this time forever. Who it could be – Rachel, Neil's hostile lover? or Arya, his college time girlfriend? or is it something much bigger than they could have ever imagined. 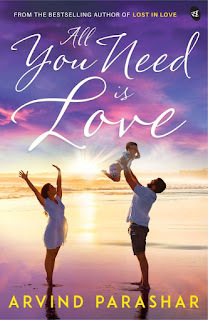 Read on to discover the life and times of Neil and Gauri and the deepened mystery in this yet another romance thriller – All You Need is Love. CLICK HERE to Buy All You Need is Love (English, Paperback) by Arvind Parashar with special offers and Options with Cash On Delivery and 10 Days Replacement Guarantee.